Are you in the market for a full-size sedan? 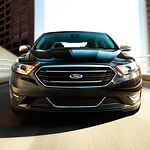 Many consumers choose the Ford Taurus because it is a reliable vehicle that is equipped with interior features that offer comfort and styling. At Awesome Ford in Chehalis, it is important to our team that we provide our customers with detailed information about our models, so you can check out a few of the interior features that come with the Taurus below. The Taurus comes with an audio system from Sony with Clear Phase. This audio system offers high-quality surround sound and 12 speakers. With this audio system, you get Clear Phase technology that provides you with sharp, static-free sound. This sound system is standard on the SHO and Limited trims. For optimal comfort, the Taurus comes with heated and cooled front seats that let you and the front passenger select from three settings. This feature is standard on the Limited and SHO trims. You can also choose Dual-Zone Climate Control that lets you and the front passenger set individual temperature settings for additional comfort.